A body scrub is done with an abrasive material—usually sea salt or sugar—mixed with some kind of massage oil and an aromatic like essential oils. If the scrub uses salt, it might be called a salt scrub, salt glow or sea salt scrub. The scrub is followed by an application of high-quality lotion or cream that leaves your skin hydrated. This 100% Natural and 100% Organic is a treatment that exfoliates the skin leaving it fresh, smooth and soft. A therapautic product, it is gently massaged onto the skin and rinsed away to reveal clean and radiant skin. 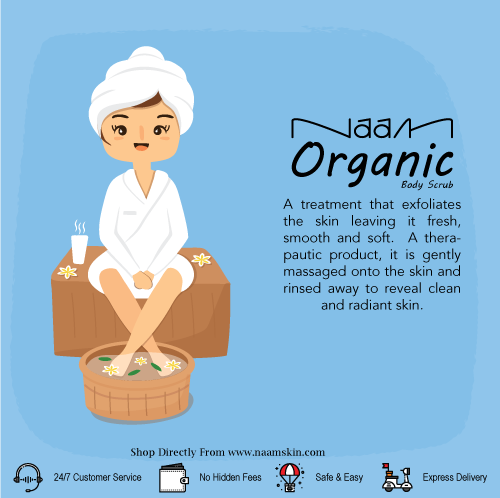 Naam Organic body scrub is very invigorating as it helps you to improve the circulation of blood and lymph throughout the body. It also actively fight cellulite and improve your skin tone. So, to show you how helpful they really can be, we've composed a list of a facts and benefits!